RC boats are a fun hobby that anyone can easily get into. They provide excitement and adrenaline without the dangers or risks other activities may pose. They are also fun for the creative or inventive type, as there is a multitude of different ways to customize and tweak the design of each boat as purchased. It’s even possible to build an RC boat from scratch! RC boats come available in a variety of different sizes, shapes, speeds and power sources. Once you have the boat you fancy most, all that’s left to need is a body of water to put it in and play with. There are even RC boats made for pools if that’s the largest body of water available! Depending on what you’re looking for from your remote-controlled boat, there’s a specific type to suit your needs. The main types of RC boats fall into five different categories: electric powered boats, nitro RC boats, gas powered boats, RC sailboats, RC warships and RC submarines. There are fast boats made especially for racing and competitive fun, and slower boats for the new hobbyist or leisurely player. For those deeply invested in the hobby, there are top-of-the-line, expensive boats sure to impress. For those not wanting to spend a lot on their boats, there are highly affordable options that still bring the same excitement. For a newcomer to the world of RC boats, a safe bet for a first boat purchase would be an electric powered one. Electric boats are the most common for casual hobbyists. Boats for entertainment purposes usually can cruise at approximately 20 mph for the lowest available speeds. One nice thing about electric RC boats is that they can be just as fast as (or faster than) gas or nitro counterparts, thanks to upgrades in modern technology. These boats can reach maximum speeds of up to 60 mph. All of the Boats in our article best RC boat under $200 are electric. For the more experienced boater, a gas-powered or nitro RC boat might be the upgrade that’s been needed. While gas and nitro boats both give that rush of adrenaline with their loud motors and great speed, there are still differences between the two. For starters, gas boats are typically larger and tend to be simpler to refuel. Nitro boats pack a higher speed punch than gas ones, so they are the superior option for racing. Nitro boats are also pricier, so it’s wise to have a solid understanding and love of RC boats before investing in one. However, Nitro boats run on a special mix of lubricants that are cheaper than standard gas, so the lifetime cost of the two can almost balance out. An RC sailboat is something fun and different to shake up the game. These sailboats utilize the wind acting on sails to help propel it. These boats work differently than any other kind of RC boat, because rather than being able to control the direction and speed of the boat directly with the touch of a hand on the remote, the user can only adjust the positions of the sails, which then will react to the wind and direct the boat. RC warships add an element of combat into the fun of the boats. They include projectiles that can be fired at opposing ships for a competitive match. These ships are more complicated than the others and should be used by experienced hobbyists. RC submarines are similar to sailboats in the way that they function, besides the fact that they explore under water. This can make it more difficult to see where to steer, but by the same token it becomes a fun challenge. One major benefit of using subs is that they can have cameras on them, which is great for underwater photography. Also, they can have commercial uses as well. They can be used for inspecting water tanks, checking the integrity of submerged boat parts, and many other things. If you are going to us the sub for this purpose, we suggest you check out our list of the best RC submarines with camera. The same basic principles operate all kinds of remote-controlled toys, including boats. All RC toys have four main components to them: the transmitter, the receiver, the power source, and the motor/servo. • Transmitter: The transmitter is what the user holds in their hands while the boat is on the water. Essentially, this is the remote control. The transmitter connects to the receiver via radio waves to send it messages about what it is being told to do. • Receiver: The receiver is a foundation of a circuit board and antennae inside the boat that take the received signals from the transmitter and use those cues to activate the motor or motors within the boat. • Power Source: The power source sustains the motor, which will then take the signals from the receiver and either steer, operate sails, or change speed depending on what the instruction is. • Motor / Servo: The motor controller differs from the servo, which creates controlled movements. This is what really puts the power in the hands of whoever has the transmitter. Together with the motor, these change speed, direction, or other physical reactions. Each type of boat has its own style of assembly, handling and driving. They all come with different price tags to satisfy all types of customers. When looking into purchasing a boat, there are a few different aspects to consider before a final decision is reached. Things to consider include price, mobility and maneuverability, and purpose. 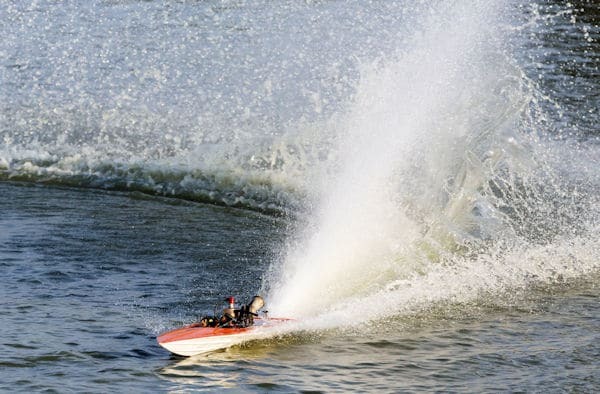 Some customers are out only to get the best of the best RC boats. Others must work within a budget. Comparing prices across different outlets, websites, and stores will guarantee finding a boat at the best possible price. Looking online can be helpful, as it’s often possible to sort results by price range. The maneuverability will determine how easy it will be to handle that boat. Some are more user-friendly and agile, while some require more complex RC knowledge and rely on strengths other than flexibility. Determining what the boat will primarily be used for will help establish the kind of mobility necessary. The purpose of the boat is key to settling with a final purchasing decision. For example, if it’s intended to be used by a teenager, a kid-friendly RC boat may be in the best interest of the user. If it will be used for competitions rather than entertainment, a speedboat would be useful. Once the best RC boat has been decided upon, the fun begins.